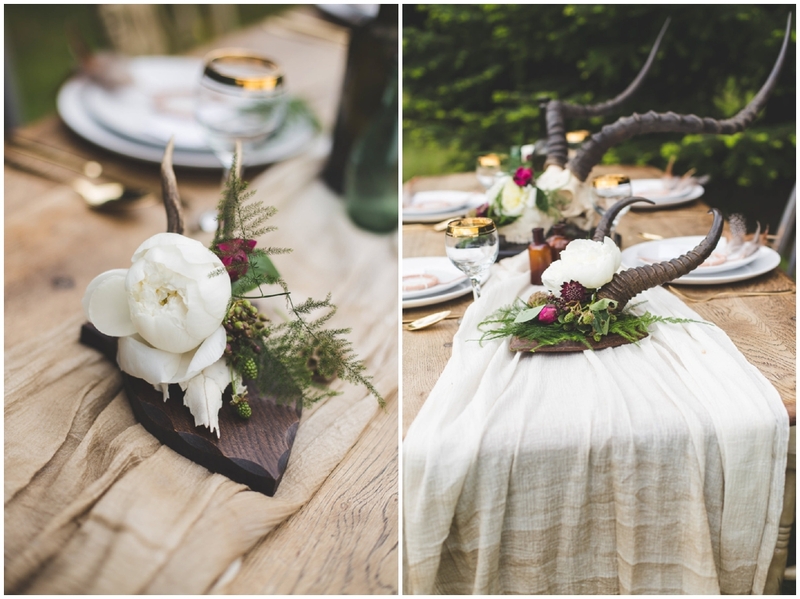 Catherine Short Floral Design worked her magic filling the antlers with a mix of wild flowers and a pop of pink to set them off against the natural wood and gold table runner. 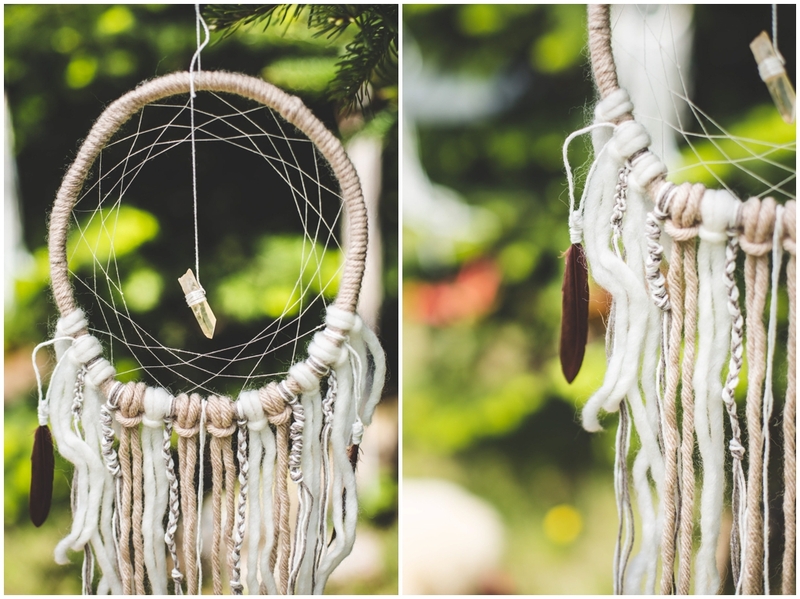 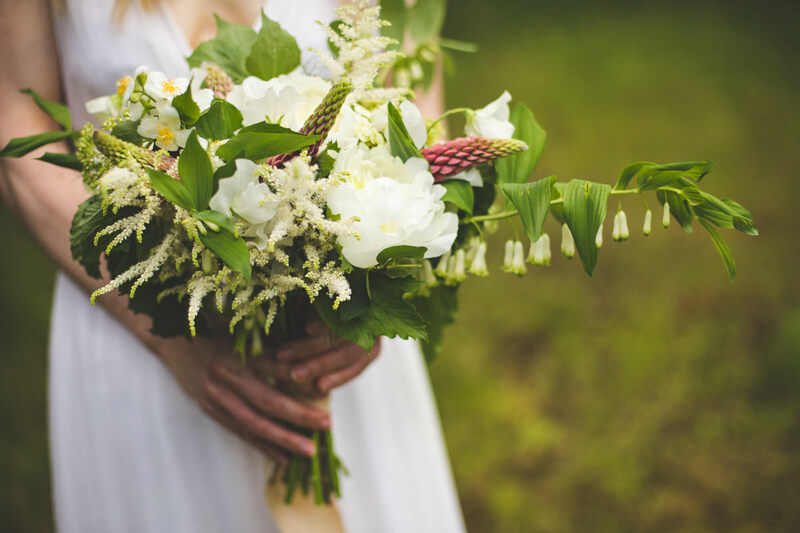 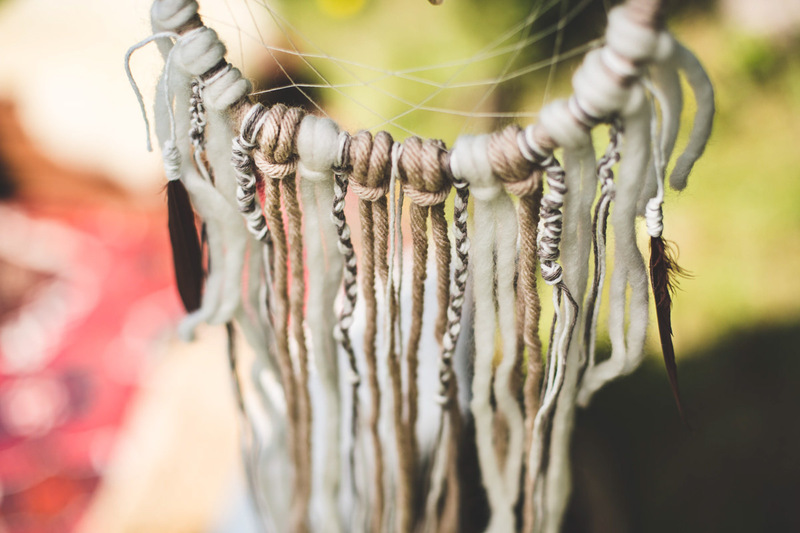 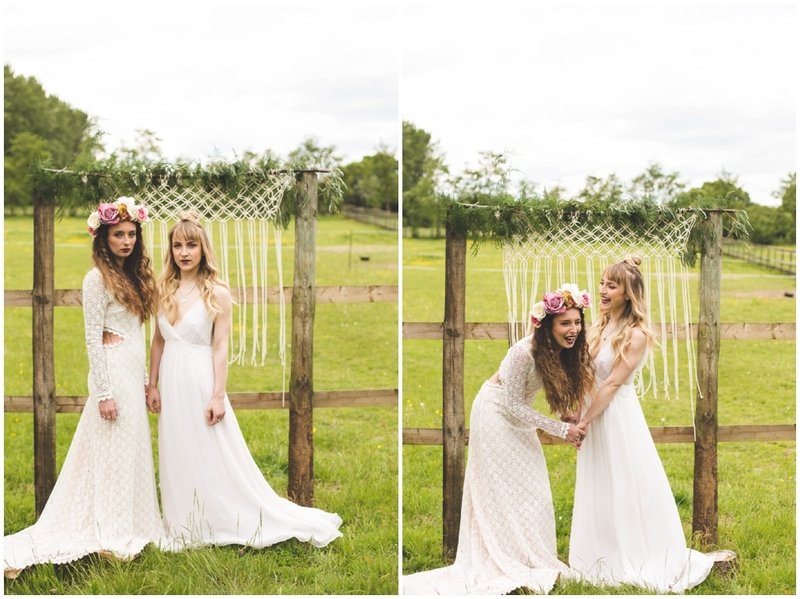 She decorated the macramé ceremonial arch with an abundance of luscious fern foliage to add that woodland vibe. 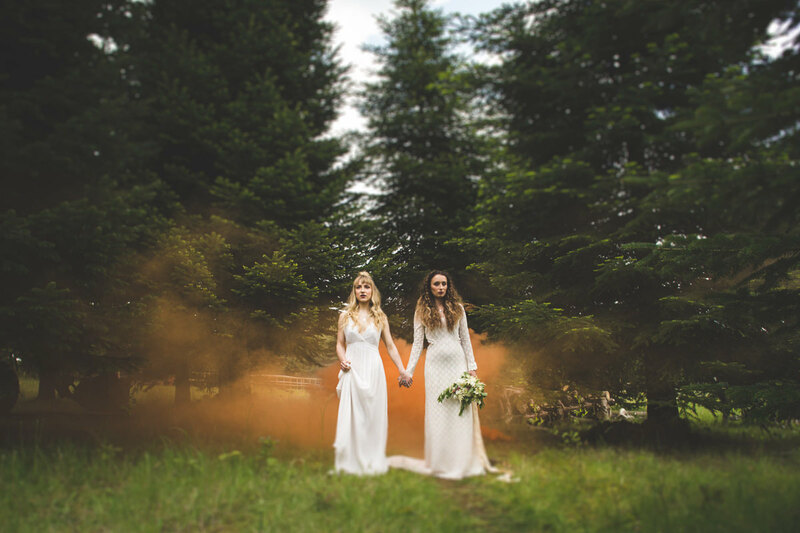 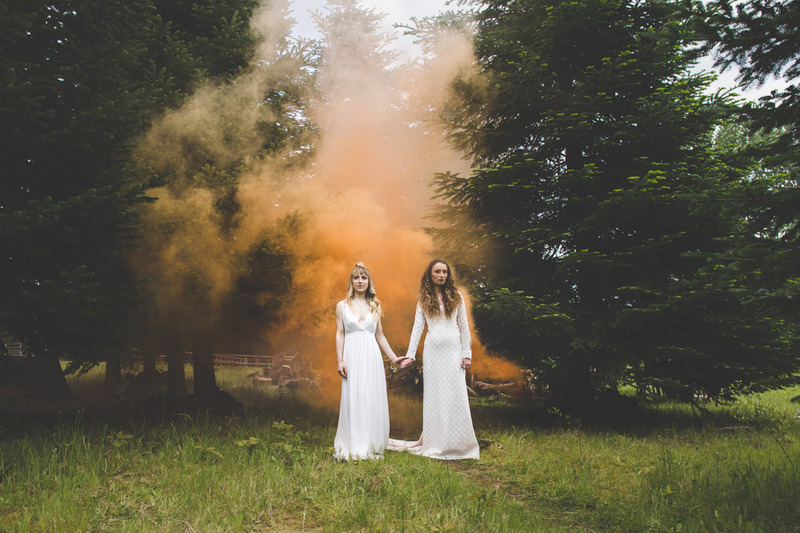 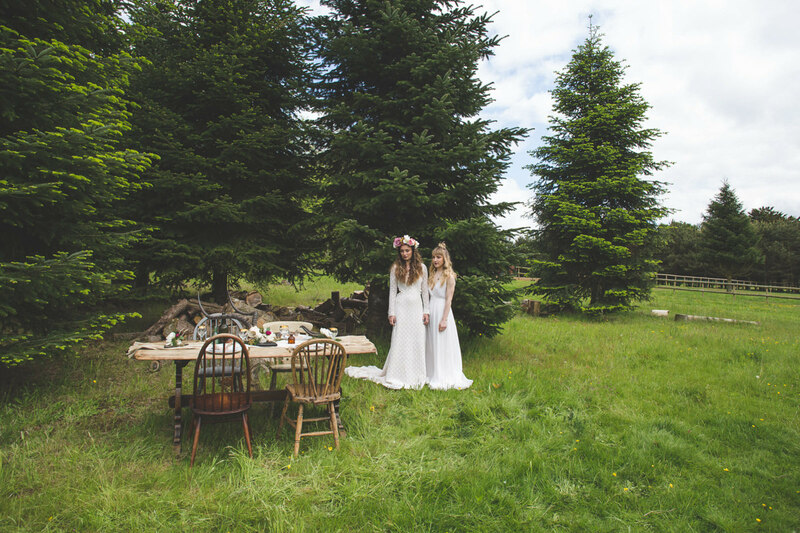 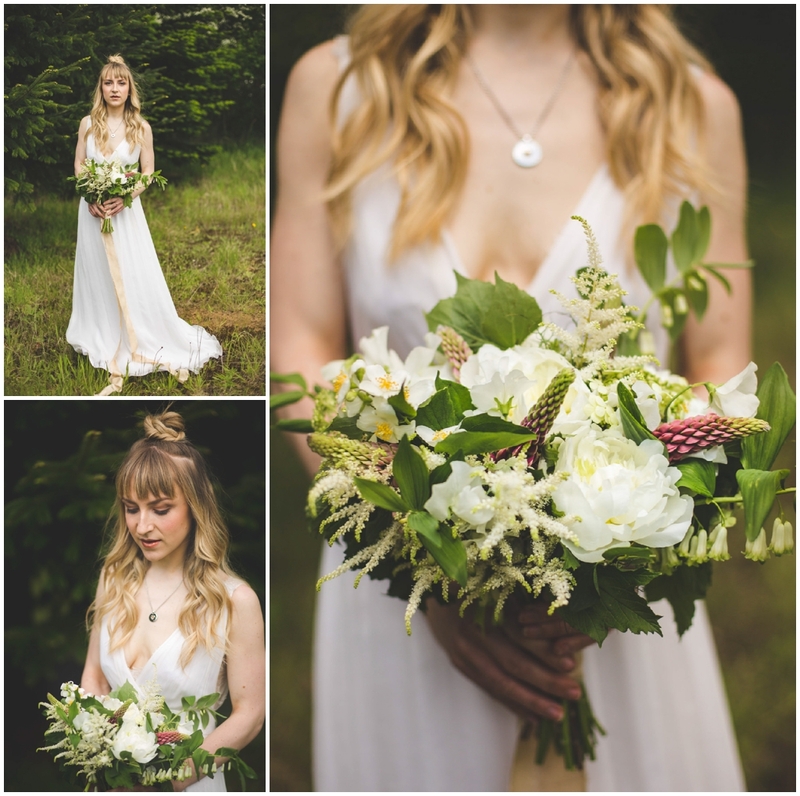 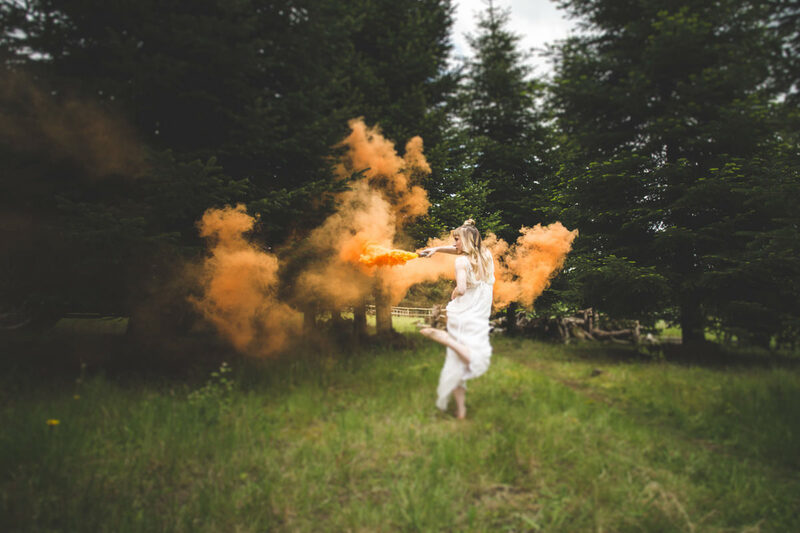 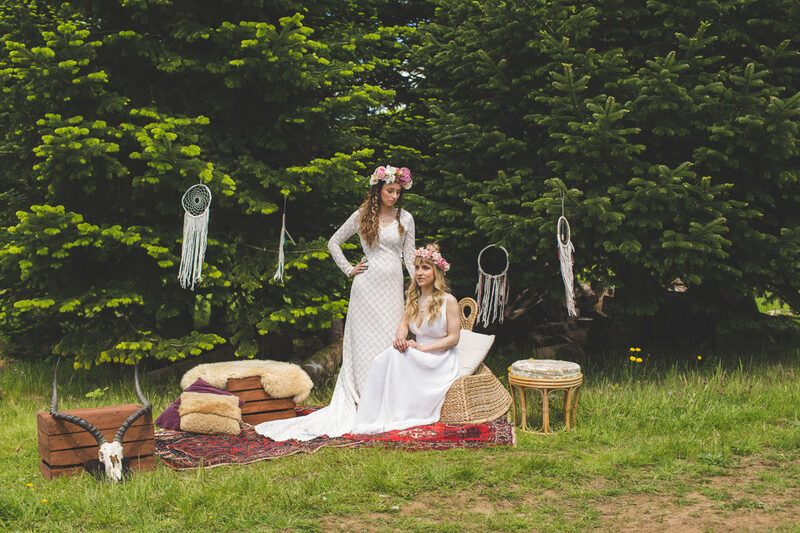 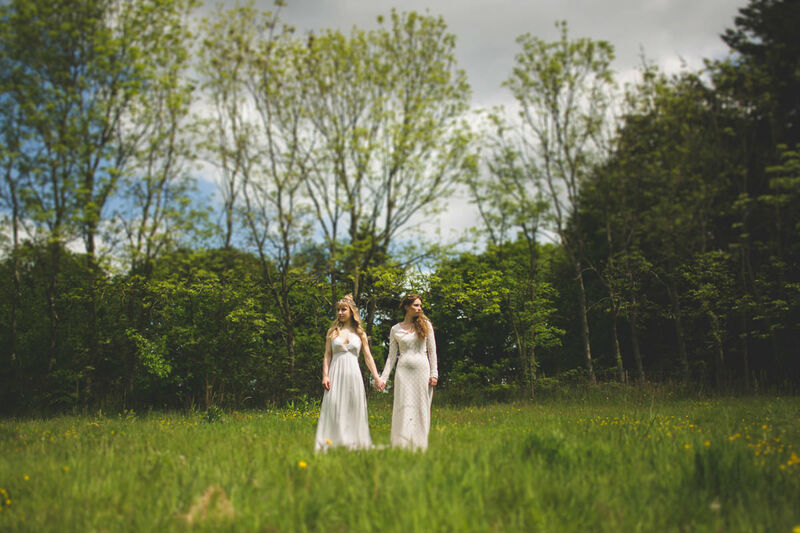 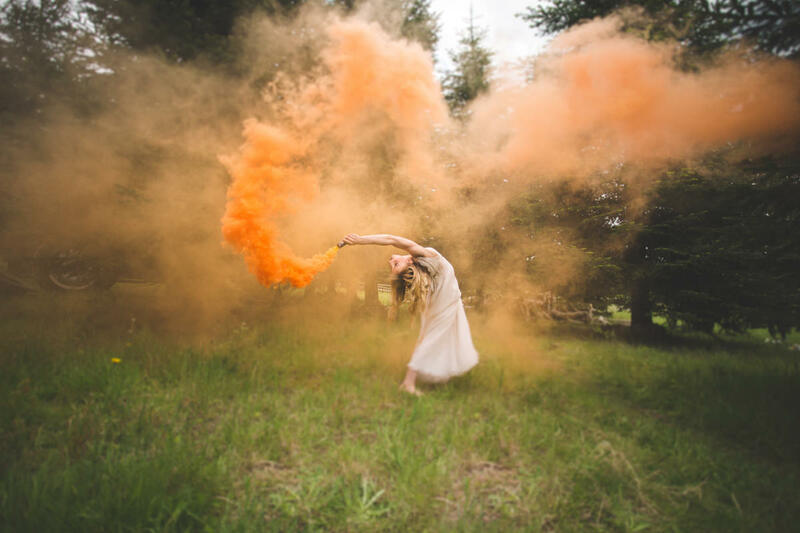 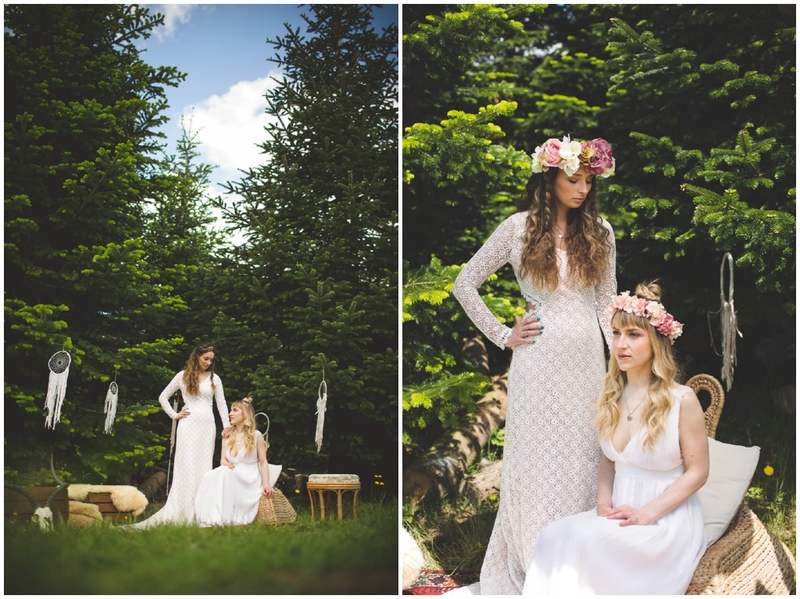 Our brides wore two beautiful bohemian gowns from the wonderful Heart Aflutter. 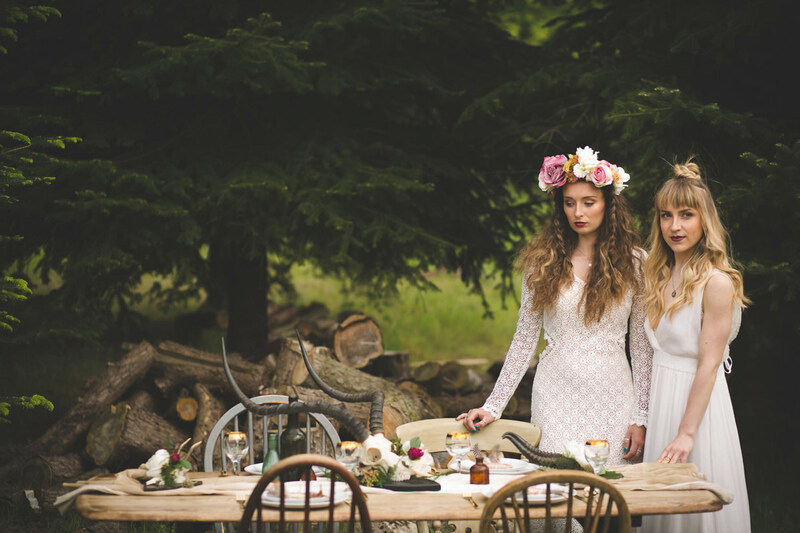 Our first bride showcased the boho chic dress from designer Daughters of Simone, a romantic long sleeved crochet lace gown with cut out back detail, teamed with full hair, a dark lip and statement floral crown from Bloom by Ellen. 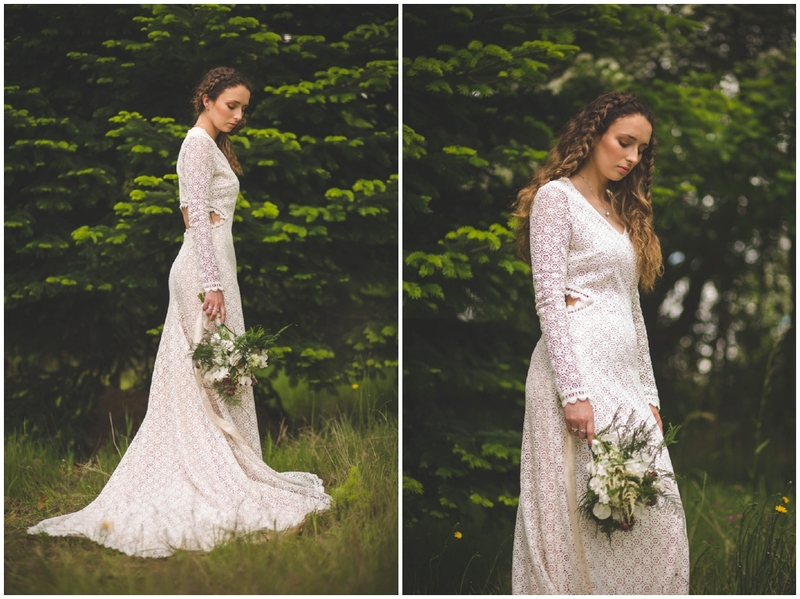 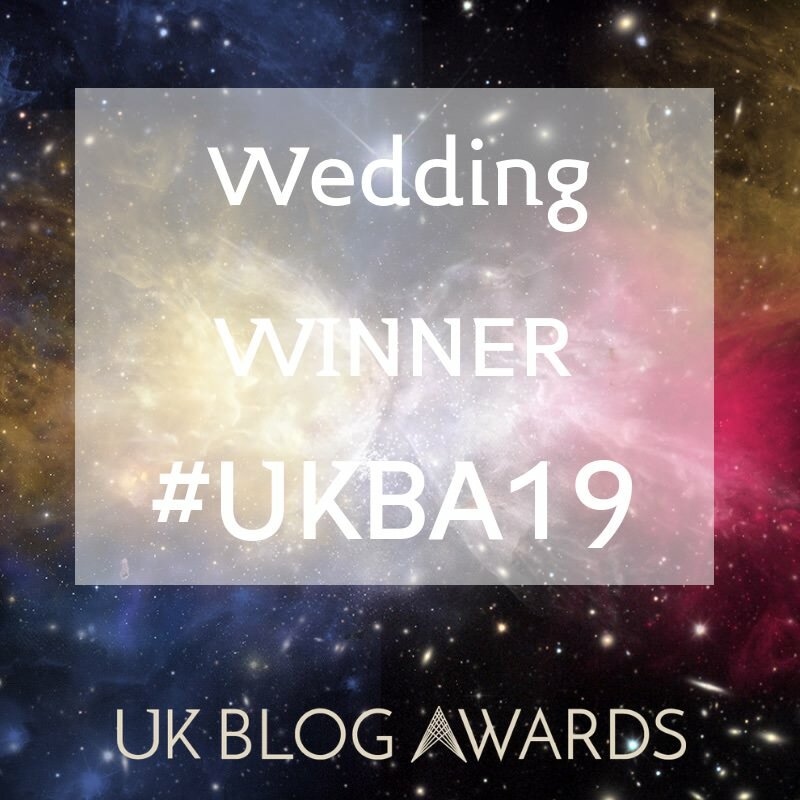 Our second bride showcased a slightly softer look with the exquisite Coralie dress by La Poesie, floaty and silky with a dreamy lace back detail. 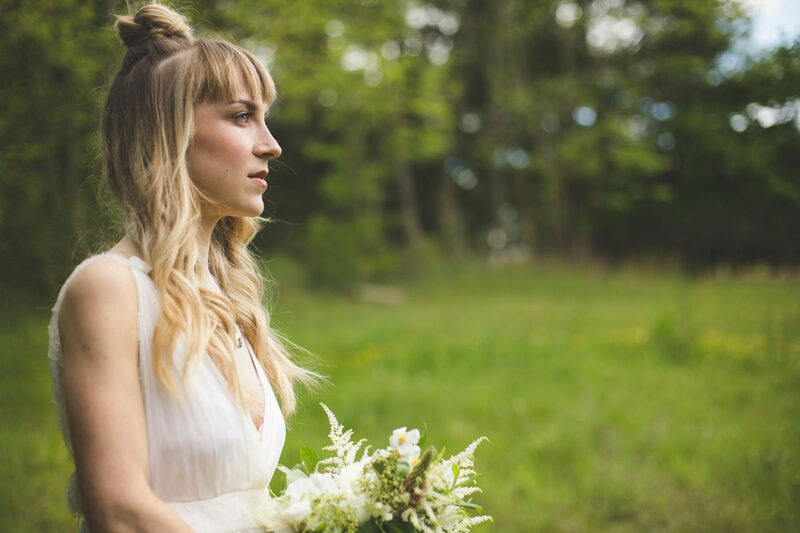 Teamed with romantic rust lip and plaited top knot for that chic twist. 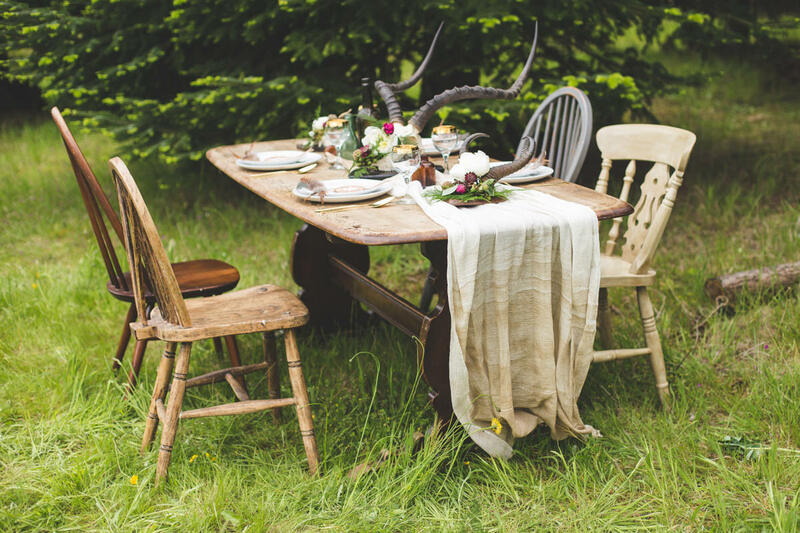 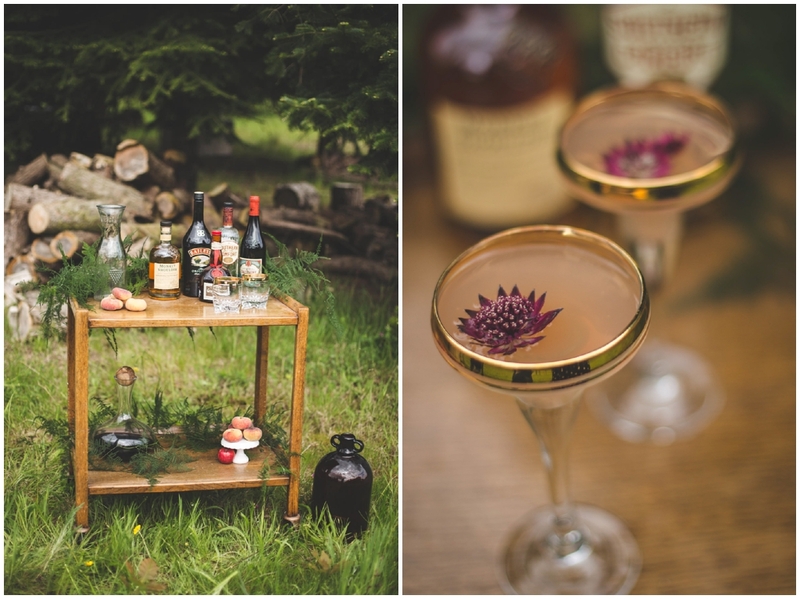 The décor was a mixture of rustic furniture and quirky eclectic boho styling. 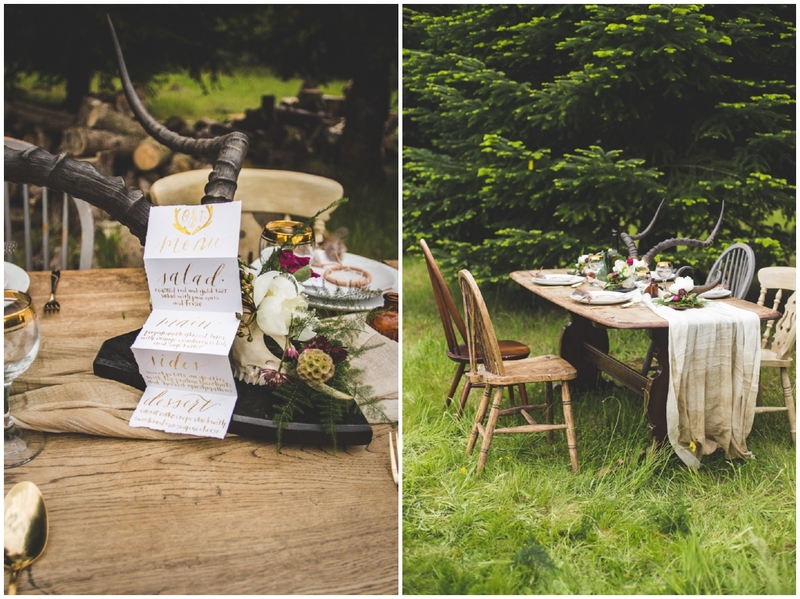 Bow & Beau did an amazing job of sourcing the props. 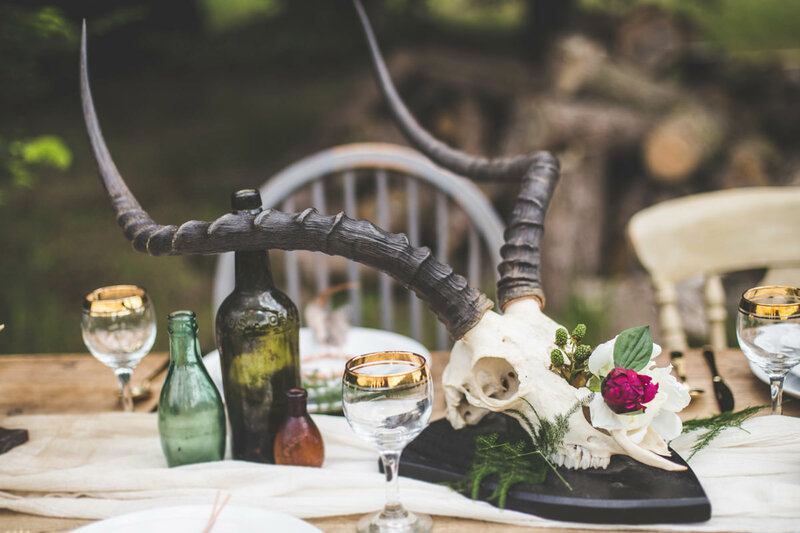 We had vintage Persian rugs, antlers, a homemade macramé and some awesome different style dream catchers and vintage old bottles. 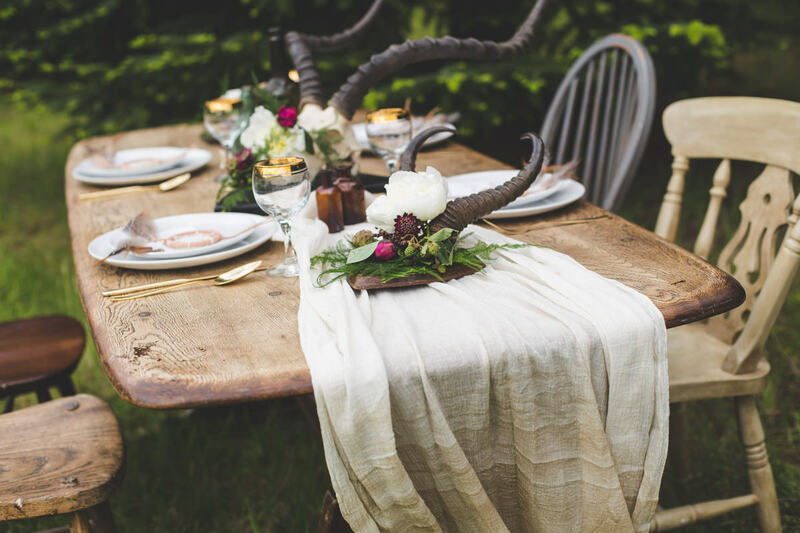 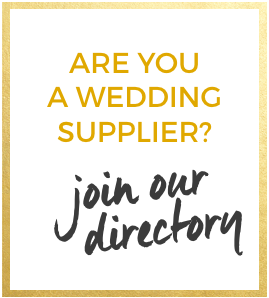 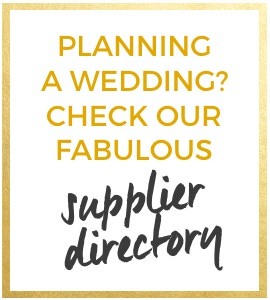 Gold featured throughout the design, with the gold dipped dyed table runner and gold rimmed vintages glasses. 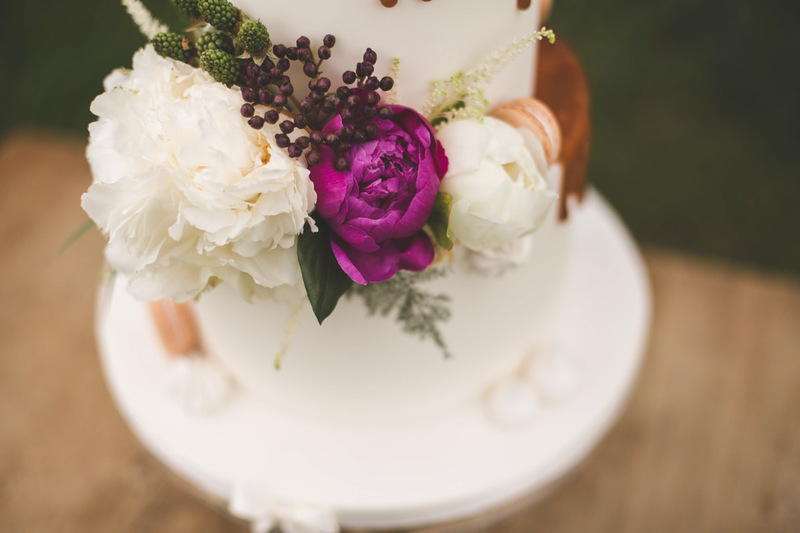 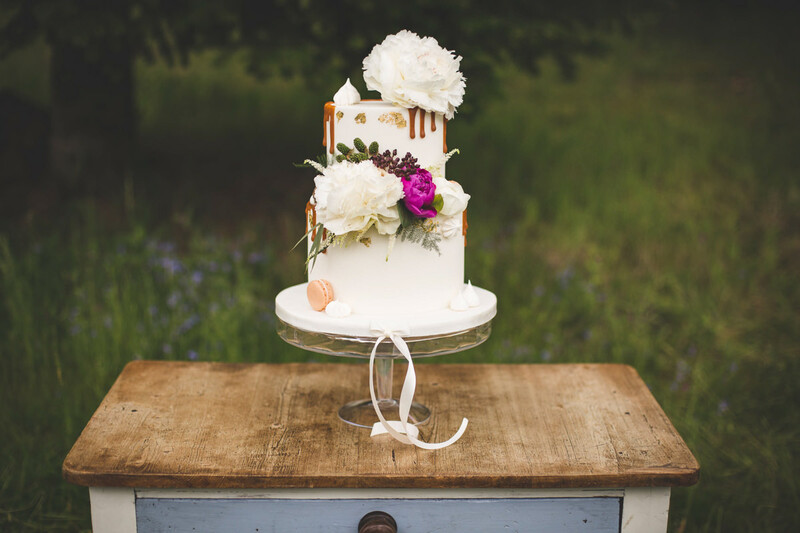 Bake, Rattle & Roll created an awesome, two tier caramel dripping delicious cake. 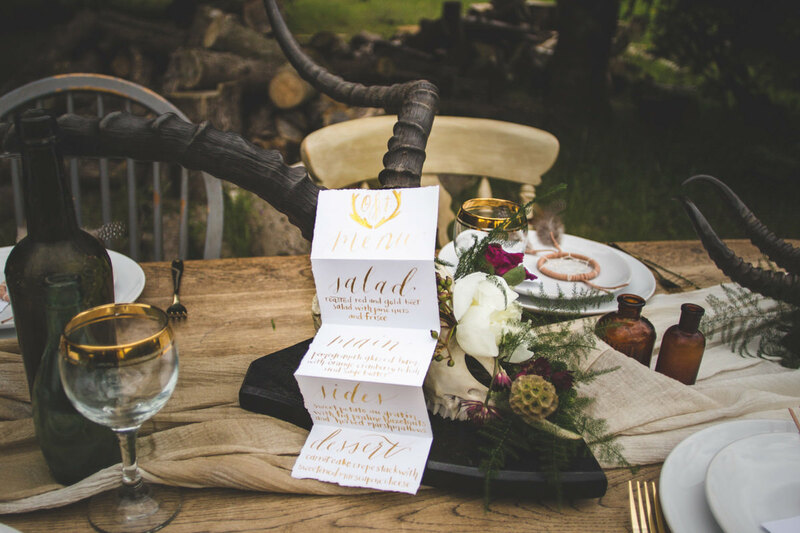 Merrie and Bright created a simple suite with gold antler illustration, modern calligraphy, and a gold patterned envelope liner.